Check out tons of betting psychologies, guides, strategies, and more to take your sports betting into a higher level! What’s your reaction after a goal was struck by the opposite team you were betting on? Are you thinking about how to get your money back at any cost? Do you feel any rage or frustration? These are common reactions. Bad runs can cause endless anger and frustration, but losing stakes are almost unavoidable when it comes to sports betting. Even the most skilled bettors has experienced a time where things are going worse for them. However, the most important thing is how you handle these losses. 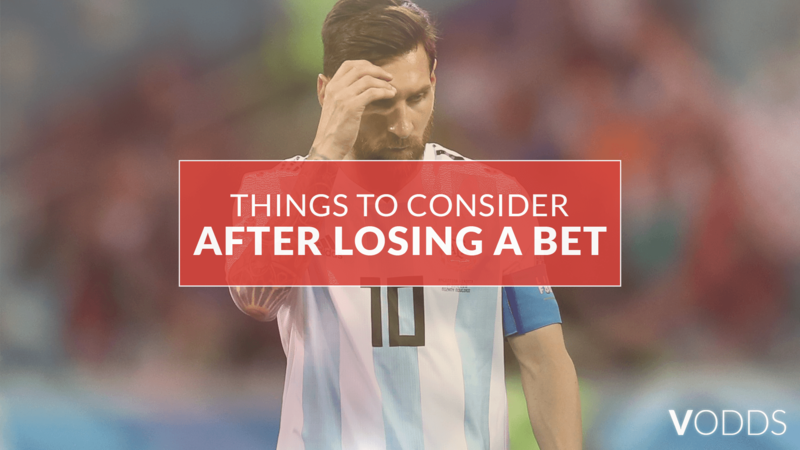 Here are ways to help you cope with the damages of losing a bet. But first things first, you should know one of the golden rules of betting; make sure you only bet with money you can afford to lose. This makes it easier to deal with a bad run. Imagine you’re a football coach who just witnessed his team lose after a hard-fought tournament. The last thing you need to do is to go straight into another intense fight. The team needs to take a break to reflect on their tactics, and assess the damages. The same principles can be useful to handling a bad run. If you feel like you did poor decision-making skills, or applied your stakes inconsistently, simply take a much needed break to assess yourself. Give yourself some time to look back, and work out why you’ve made a poor decision. There’s no harm in taking a break. Slowing down can even help you cool off and reexamine your strategies. Do you ever get that annoying feeling where you are trying something that just won’t work out for you? Did you stick to your staking tactics? Did you analyse a particular match as you had planned to? Was there something wrong in the plan you made? You have to be honest with yourself in order to reevaluate your game plan. Professional punter Patrick Veitch, one of the most feared full time gamblers in the UK, is continuously developing his approaches in the battle to stay ahead of the game. There are actually vulnerabilities of sticking to only one strategy – it can be the cause of failure among punters. If your tactics before seemed to work out in the beginning, it’s possible that there are some holes in it that caused you to have a bad run now. Don’t always insist on your initial beliefs, and be open to more strategies. Take a look at your betting history, and review your choices. A good habit to get into is analysing yourself. See where you went wrong, and make notes. There’s no better way to improve yourself than accepting a loss, and working your way through it. When you’ve experienced losses, it’s tempting to get the money you lost by placing bigger stakes. It’s actually a bettor’s fallacy, and could damage more than it could do good. More carefully thought through bets are usually the most successful ones. Cut out the bets you think will help you win, or merely popular bets when a live fixture is on, and focus solely on the aspect/s you know the best. Simplify and use a sports trading platform to get ahold of odds from numerous books. Learn to stay consistent, and stay within the limits you’ve set for yourself. Even the best and professional punters experience losses when betting. Losing is a common possibility that all bettors have to deal with as soon as they place their stakes. But every bad run is a good opportunity for all bettors to review their staking tactics, and bet choices. And rather than beating yourself up, look for ways to improve yourself and do better on your next game. You can even take a moment to sort yourself out, reconsider your strategies, and bet again when you’re all set and ready. Always remember that learning to control your emotions after dealing with a bad run is without a doubt the greatest piece of self-development you can ever get. Now pick yourself up, prepare more carefully and thoroughly, and have fun! Are you feeling more confident now? Log in to your Vodds account and check out available tennis and football matches you can place bets on, or register if you don’t have an account yet. © Copyright 2018 Ole Group International Limited. All rights reserved.